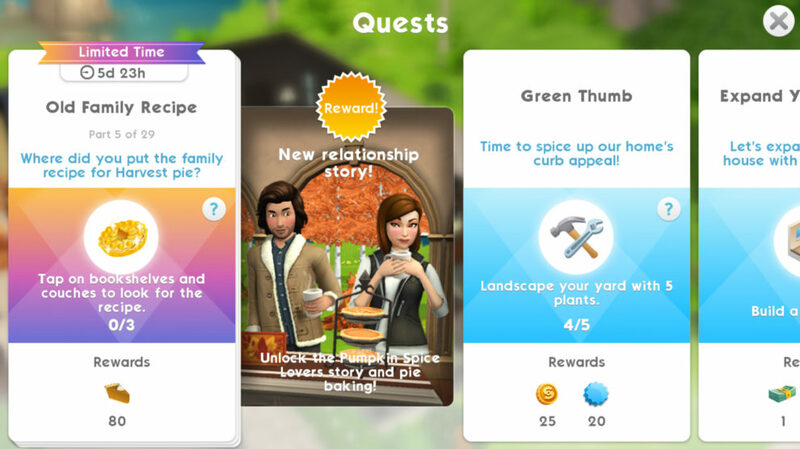 A new event has arrived in The Sims Mobile, celebrating the autumn season. 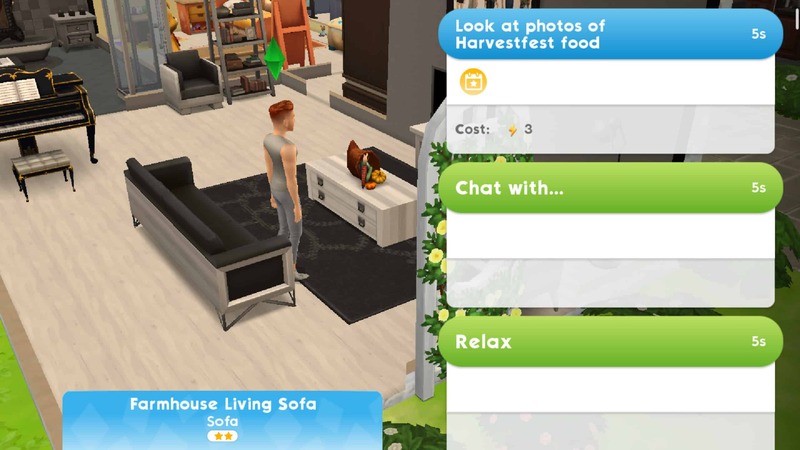 The Harvestfest Event has hit Simsville, bringing with it a wide assortment of autumn-themed goodies, including a new relationship story! 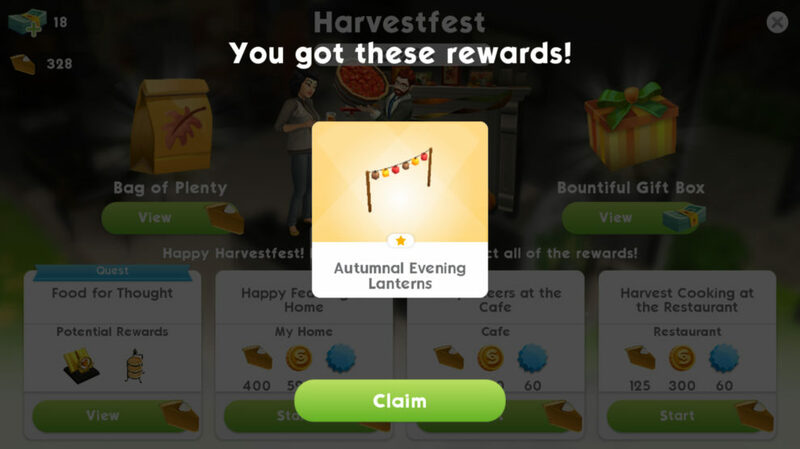 The Harvestfest Event is a goodie bag event. It follows the same structure as previous events where players would need to open mystery bags to collect a random prize. 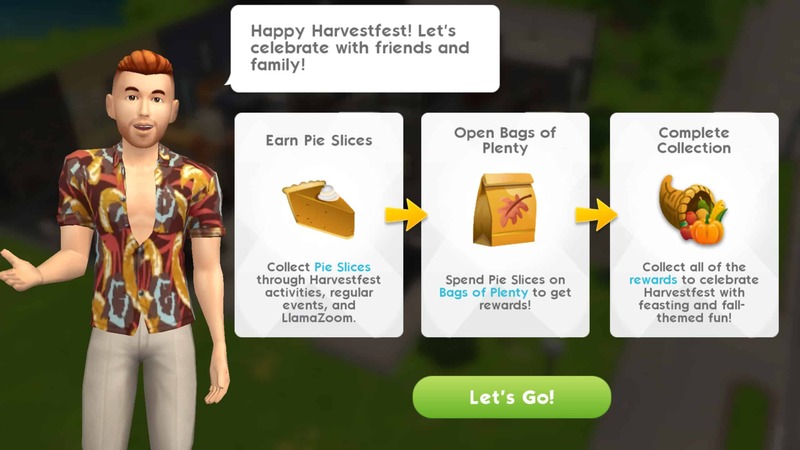 Earn pie slices by completing the limited-time quest steps and completing events, then spend your pie slices on Bags of Plenty to collect a random reward. Open as many Bags of Plenty as you can to complete the collection. The limited-time event quest has 29 parts. 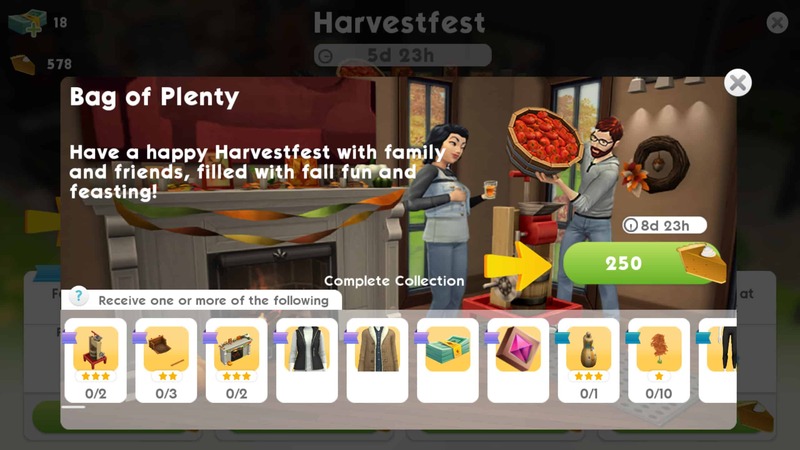 Players will have 6 days to complete it and finish their Harvestfest collections. Wondering where to begin? We’ll guide you through the first few quest steps to help you get started. Make sure to check out our tips and tricks section below this guide for even more helpful advice on how to make the most of this event. 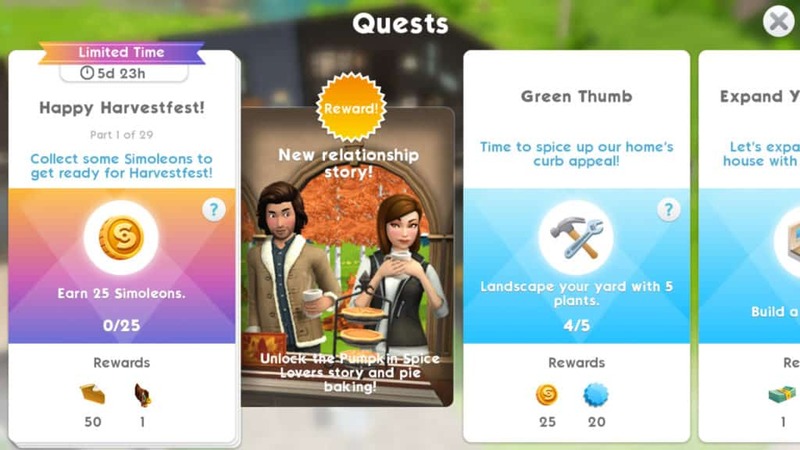 When you open the game after updating, you’ll see a new limited-time quest. This is the quest you should be focusing on. 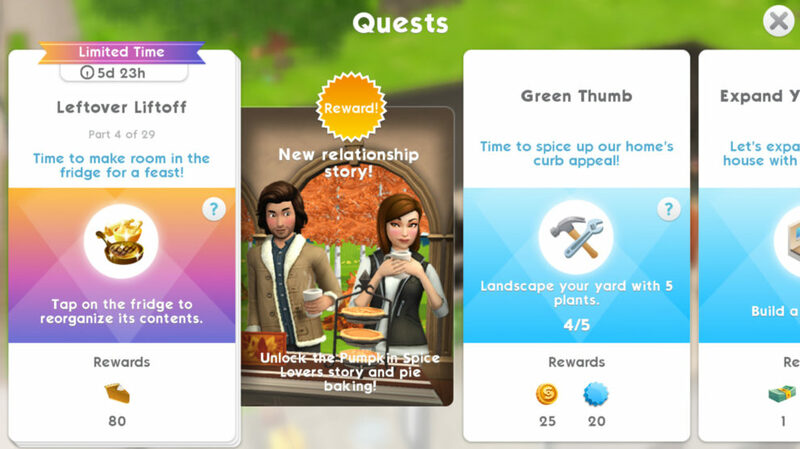 This new quest is for the Harvestfest Event. Completing it will help you earn pie slices to spend on Bags of Plenty. This first task is super easy. Just send any of your Sims to work. One short shift should easily satisfy this goal. You might even get 25 simoleons just from watching a video, too, so keep an eye on your mailbox. Another easy task. All players received a Horn of Plenty for this event. It can be found in your household inventory. Open up your inventory, find the Horn of Plenty, and place it anywhere on your lot to collect from it. If you have a lot of stuff in your inventory, it might be hard to spot. Look through everything carefully. It’s in there somewhere! The Horn of Plenty slowly replenishes its Pie Slices over time. Make sure you collect from it frequently to avoid the Horn of Plenty getting full. Once its full, it won’t continue producing Pie Slices. Your third easy task is also a quick one. Just tap on a couch to have your Sim look at Harvestfest photos. There’s nothing like a little inspiration to fuel a feast! 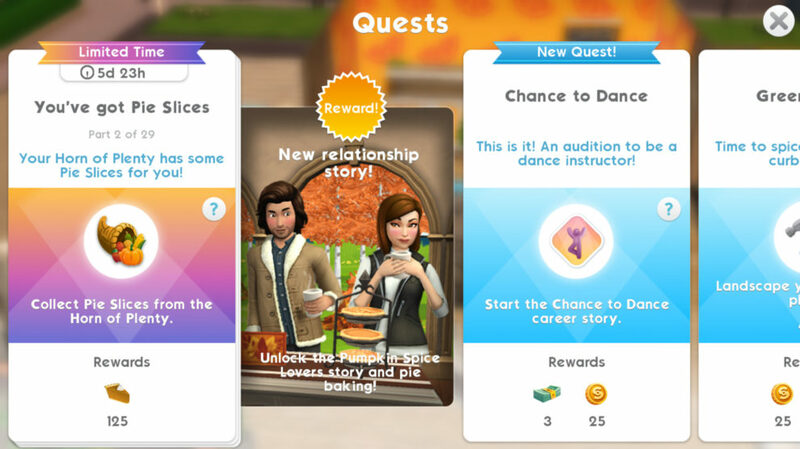 After getting to Part 3 of the quest, you’ll receive some free Pie Slices to help you get started. A mini tutorial will walk you through how to purchase Bags of Plenty with your Pie Slices. 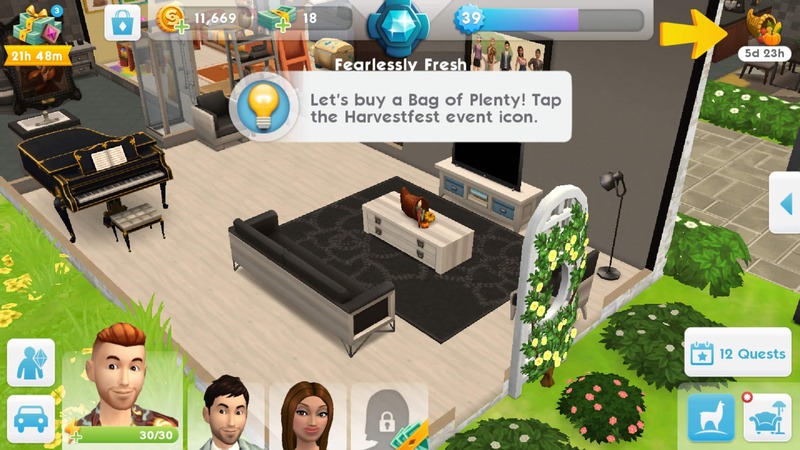 Just tap the event icon in the top right corner of your screen and select the Bag of Plenty. On the Bag of Plenty screen, you’ll be able to see all the prizes you can win and their rarity. Tap the green button to spend your Pie Slices and open the Bag of Plenty. I received Autumnal Evening Lanterns from opening my first Bag of Plenty. Neat! Yet another easy task. It’s been smooth-sailing so far, hasn’t it? We’re not complaining! Tap on a fridge to have your Sim complete this goal quick and easy. This task is fairly easy as well, but you’ll need to do it three times. Tap on any bookshelf or couch to look for the family recipe. 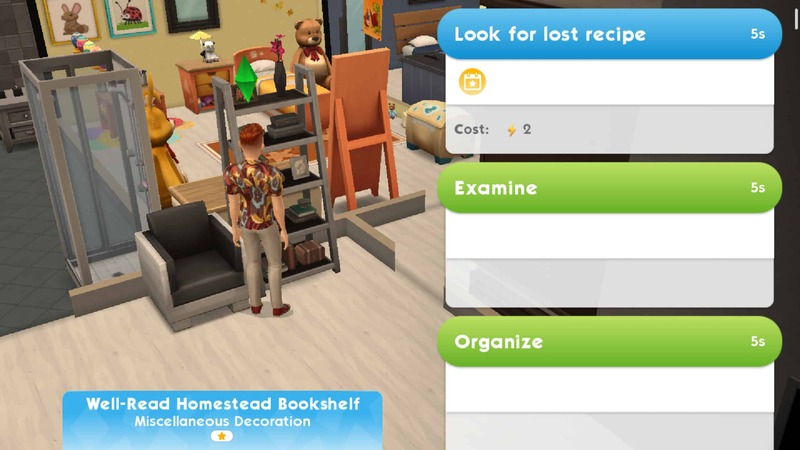 There is a cooldown period for this action on each item, but you can get around this by tapping on three different bookshelves or couches. If you’ve been playing The Sims Mobile for a while, you probably have an old couch or two in storage that you don’t use anymore. Bring it out to complete this goal if you need to. You can put it back in storage right after. This could be an easy or difficult goal depending on how you do it. We’re going to tell you the easy way. 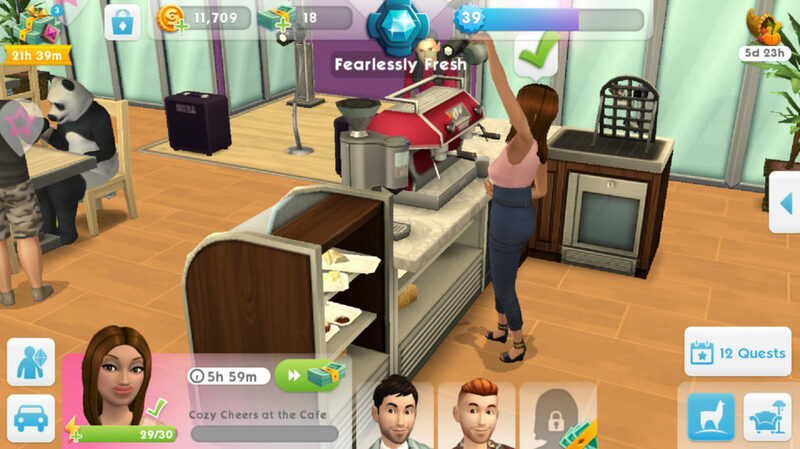 Tap on any Sim that your Sim doesn’t already know to introduce themselves. Then tap the Sim again to begin a relationship. If your Sim has the 3-star Good Upbringing trait, they’ll be able to finish this event in 3-4 actions easily. You’ll be finished the event in under a minute with very little energy spent. If you don’t want to start a story with the Sim you just met, select Choose Later when the event ends and you’re prompted to select a story. If you’ve been thinking of giving your Sim a makeover, now’s a good time to do it! 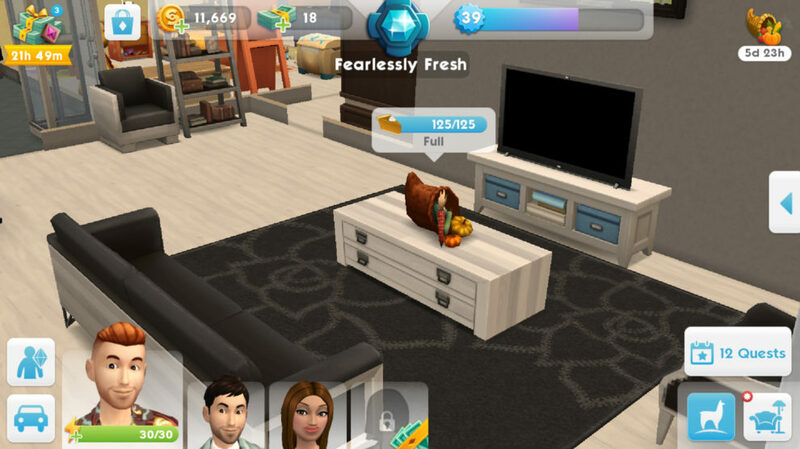 Open your Sim’s info panel and select Change Appearance. Make any changes you want in CAS, then select Play. Boom! You’ve completed Part 7! That was easy! From here on out, the tasks are going to become more time-consuming, but hey, you’ve gotten a great head start! 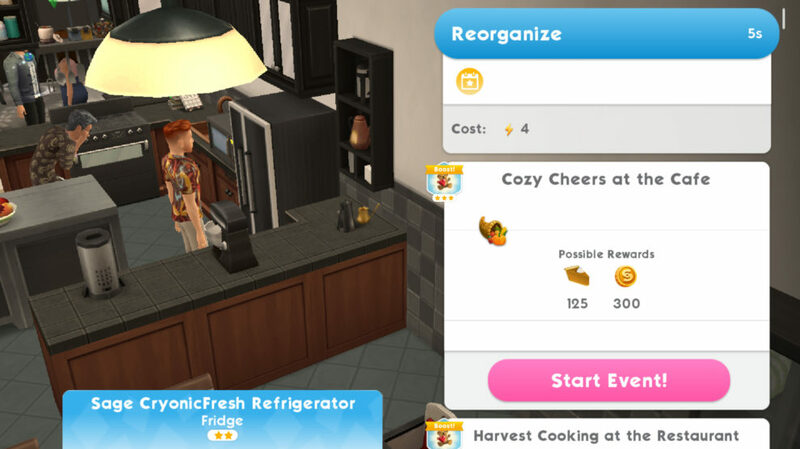 You can begin any of the new Harvestfest events one of two ways; by opening the event page and tapping on the event, or by tapping the leaf icon above the fridge and selecting an event. Begin the Cozy Cheers at the Cafe event. It’s a 6 hour event so make sure you’re checking back in with the game frequently to finish it faster. It’s all up to you from now on, but we think you’ve got the hang of things by now. Don’t worry, we’re not about to leave you completely in the dark. See our tips and tricks below for more advice on how to get through the rest of this event. All the goodies you can get from the Bags of Plenty are nice to have, but the real prize of this event is the heirloom. 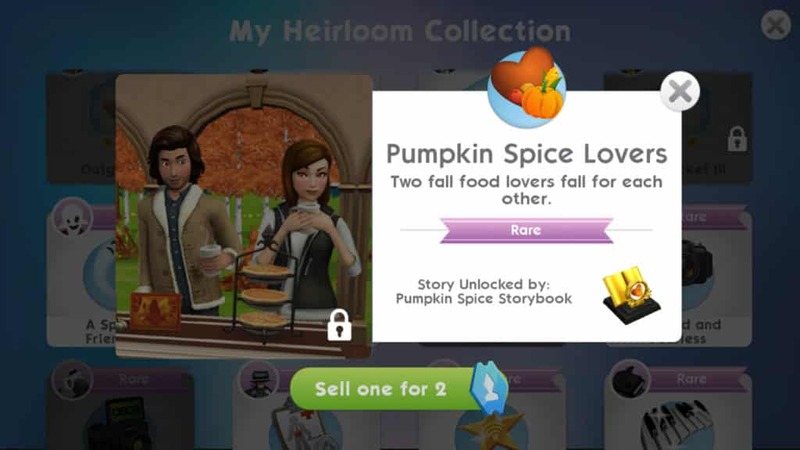 It adds a new romance story to the game called Pumpkin Spice Lovers. You won’t find this heirloom in the Bags of Plenty. You’ll have to finish the Harvestfest quest in time to earn this grand prize. Prioritize the quest over everything else. 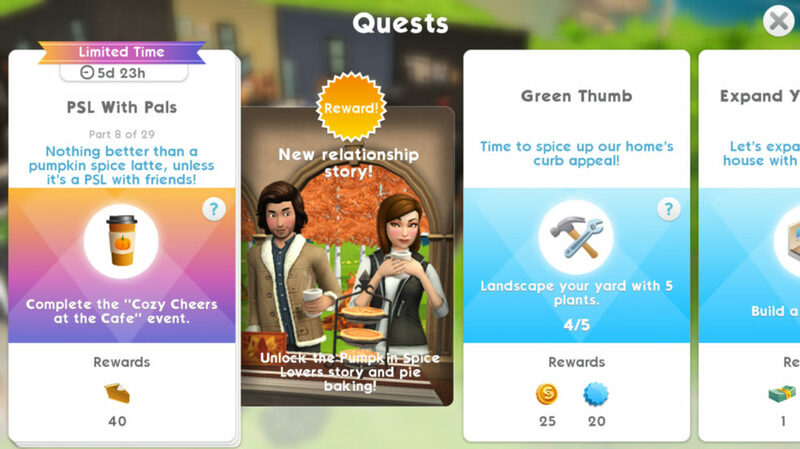 You’ll get lots of Pie Slices to spend on Bags of Plenty by doing the quest, anyway, so you won’t miss out on those rewards. Emily is adorable, but she is also extremely demanding. You can bet you’ll be asked to complete her LlamaZoom tasks several times throughout the duration of this quest. Emily will often ask you to complete at least one long event, which eats up a lot of time you can’t afford to waste. Make sure you have one Sim doing long events in anticipation of Emily. 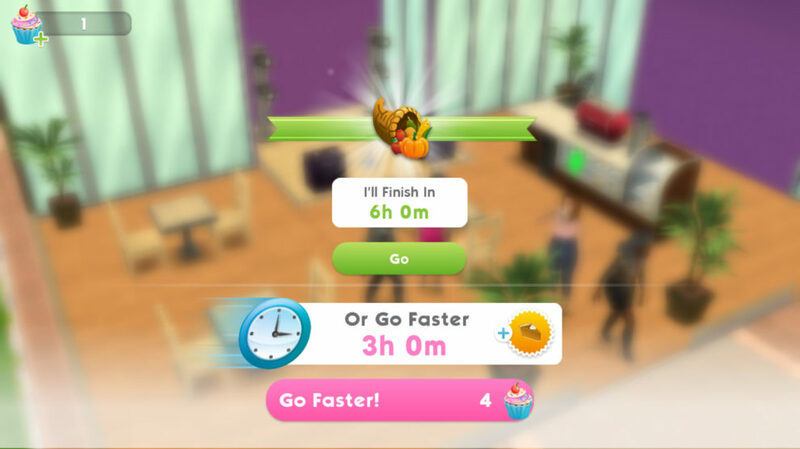 When she does ask you to finish a long event, you’ll already have a Sim who’s almost finished with it so you can save 7-8 precious hours and complete that task instantly. Most short events take one hour to complete. It takes an hour and a half for a Sim to fully replenish their energy. Keep these time frames in mind and set a timer on your phone whenever you’re able to. 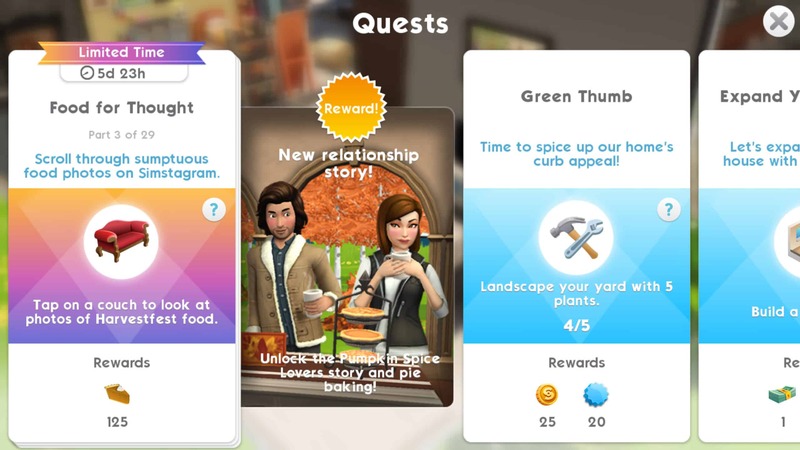 This will remind you to check back with the game frequently so you can speed through the quest without worrying that you may have left your Sims doing a one hour event for the past eight hours. Your cupcakes and SimCash are there to be used, but be sparing and smart about how you use them. If time is running out and you’re still several steps away from finishing the quest, it might be time to break out that emergency cupcake stash you’ve been saving up, but don’t throw away these precious resources too early. Save them for when you really need them. Work the quest around your real-life schedule as much as possible. Anticipate when you’ll be busy with work, school, or social engagements and plan your gaming sessions around them. 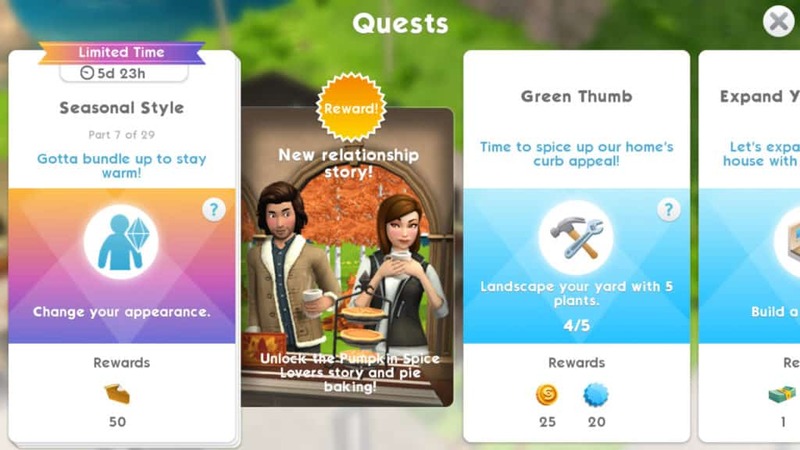 If you know there’s a quest step that’s going to take 7-8 hours, try to get your Sims started on it before bed, work, or school. 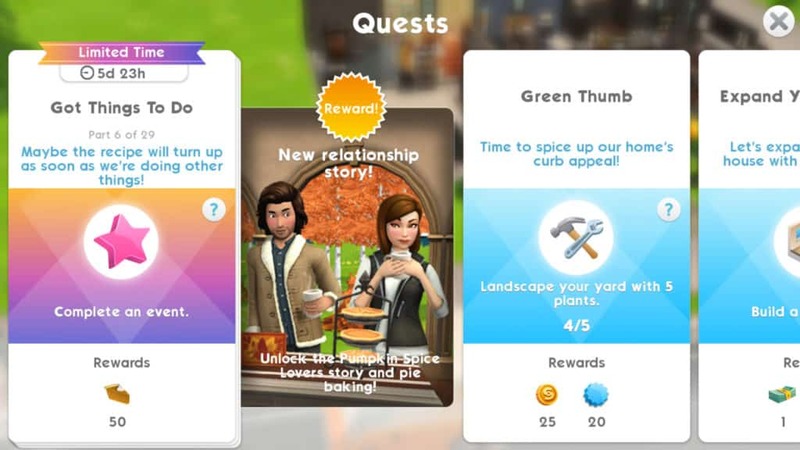 If you have some free time, try to speed through the shorter quest steps and one-hour events. Selecting the relationship tasks when you need to complete a LlamaZoom request is to your benefit because you can get those three short relationship events out of the way in minutes. Just find a Sim your Sim doesn’t already know, start a friendship event and breeze through it. When you’re prompted to select a relationship story for them, don’t choose one! Select Choose Later instead. Then continue doing those quick and easy intro events instead to complete Emily’s request. Relationships go much faster than hobbies and careers. 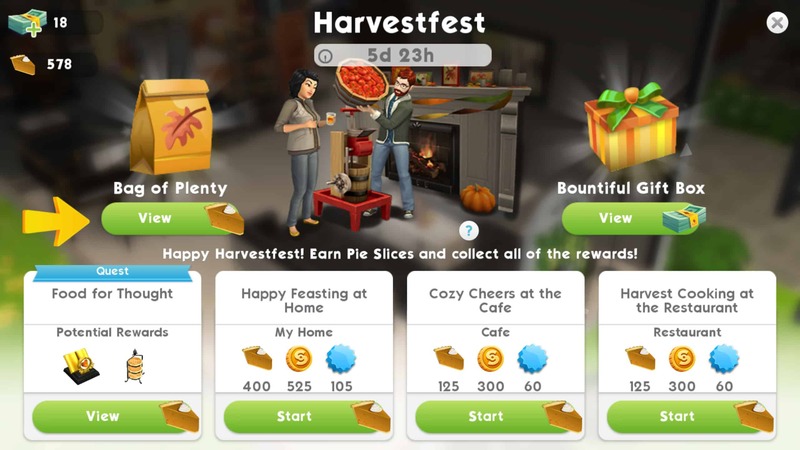 How far are you in the Harvestfest event? Let us know in the comments or on social media! Sul-Sul, Pumpkin Spice Lovers! Don’t see any changes? Update your game! Go to the game’s app page in the Google Play Store (Android) or the App Store (iOS) to download the latest update and read about what’s new in the game. I’m on task 8 like you. I bought the $9.99 promotion & you get 10 free bountiful harvest boxes with it. I got the fireplace & the horseshoe pit & neither of them have showed up in my inventory & under the prizes it’s still listed as zero, like I didn’t win them! This game is getting ridiculous. I’m also halfway through “Rumblings in the deep” in the science center & went back today, just to find out that I’m locked out AGAIN! I completed the dance instructor task & can’t use it because I pay & then get locked out of the wellness center (AGAIN!). This is happened away least 4 times & they only refunded me my $11,500 coins the first time it happened, argh! Sorry for the vent… just frustrated. I am having the same issue didn’t receive my Autumnal String of Lanterns should have had 2. I am currently on Step 13. I am not impressed with the EA Help personnel I have called a couple of times after being shorted and also losing all the Spring Event rewards and having to repurchase items that were lost such as house/clothing items. Am I the only one having glitches since this quest started? My sims are doing their quest without any activity star for me to choose. I can’t make them do anything and have to wait for the clock to finish the quest. Other time I play after stepped away, my sim was doing nothing while I left them to do an activity. Hi! 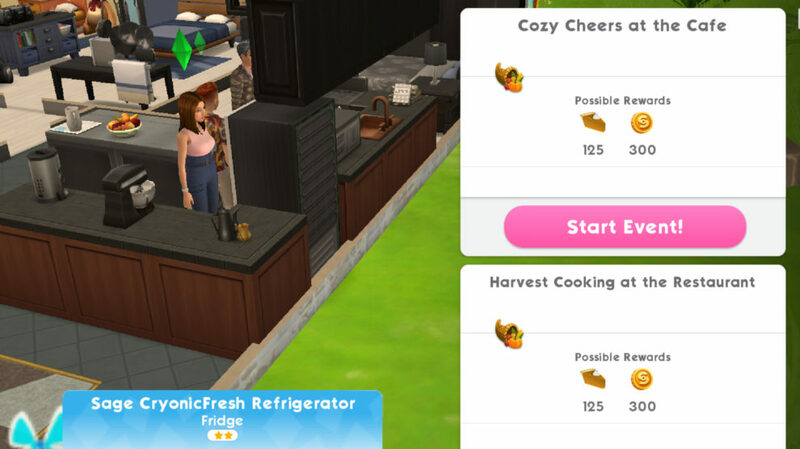 I have finished Part 13 Harvest cooking at the restaurant earlier today but nothing happened. The quest doesn’t show it as completed and if I click the button again I can not do the event again. So basically I am stucked. Can anyone help me please? is it possible to finish this event in the time given? Struggling to see how, giving how many times you have to collect 1200 pieces of pie. I am on step 18. Make sure you use that little cornucopia thing they gave you to add pie slices to your tally. Also, completing regular tasks like your job & hobby usually gives you slices too (make sure you ALWAYS watch the video to receive extra bonus coins & pie).